Awards | TERRA NOVA® Nurseries, Inc.
2015 – Heuchera FOREVER® Purple – A Top Performing Perennial at the Massachusetts Horticultural Society 2015. Won the “Too Good to Wait Performer” award at Colorado State University trials 2015. In addition FOREVER® Purple had 100% survival in the 2014-2015 winter at the University of Minnesota Perennial Flower Trial (with very little snow cover!). This was its first trial year there. 2015 – Brunnera ‘Alexander’s Great’ – Won the “Too Good to Wait Performer” award at Colorado State University trials 2015. DOLCE® Heuchera Series (which includes the following TERRA NOVA® Plants: Crème Brulee, Key Lime Pie, Licorice, and Peach Melba) won 29 awards according to Proven Winners. Including: Top Performer, Mississippi State; Excellent Rating, Boerner Botanical Garden, Milwaukee, Wisconsin; Gardener’s Choice, National Arboretum; Top Performer, Ohio State. 2013 – Agastache ‘Blue Boa’ – Won the first “Too Good to Wait Performer” award at the 2013 Colorado State Perennial Trials. 2013 – Agastache ‘Kudos Coral’, Agastache ‘Violet Vision’ – Best of Species in Penn. State Trials 2013. 2012 – Agastache ‘Blue Boa’ – the favorite Agastache in the 2012 trials at Ohio State University. “Favorite Agastache; very floriferous all season”. 2011/2012 – Agastache ‘Blue Boa’ – One of top ten perennials in the 2011-12 trials at the Massachusetts Horticultural Society. 2009 (December) – Rudbeckia ‘Henry Eilers’ – Voted the winner in the Classic City Award for best top performers in the Trial Gardens at UGA in 2009. 2009 (February & December) – Echinacea ‘Tiki Torch’ – Voted the winner of the 2009 NMPRO New Plant Pavilion at the ANLA Management Clinic. Winner in the Classic City Award for best top performers in the Trial Gardens at UGA in 2009. 2008 (July) – “Best New Plant” award for its Heuchera ‘Midnight Rose’ at the 2008 Woking Nursery Exhibition held in July at Guildford College, Guildford, England. 2008 (May) – Three TERRA NOVA® Varieties win first place at the Royal Dutch Flower Show. KAVB (the Royal Dutch Flower Bulb Association) awarded scores of 9 out of 10 (First Prize) for Heuchera ‘Sparkling Burgundy’, Heuchera ‘Marmalade’ & Heuchera ‘Peach Flambe’. Certificates for the awards were received on Feb 10th, 2009 at TERRA NOVA®’s facility. 2008 (May) – TERRA NOVA® Nurseries, a world leader in plant breeding and genetics, was awarded a blue ribbon for its Begonia ‘Metallic Mist’ by the American Begonia Society at its national convention in Texas in May. 2006 (July) – Award of Garden Merit awarded to Sedum ‘Mr Goodbud’ AGM (H4) 2006 by the Royal Horticultural Society. 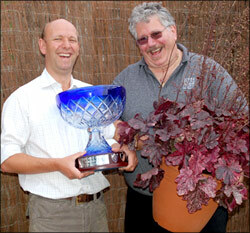 2006 – Best new hardy plant introduction at the Four Oaks Trade Show for Heucherella ‘Stoplight’. 2004 – Kees vd Aardwegh – Bloemenkeuring in Holland. 2004 – Kees vd Aardwegh – Gouden medaille in Holland. 2002 – Athyrium ‘Silver Falls’ – Winner of the 2002 “Stars of Spring” award in New Zealand. 2001 – Heuchera ‘Amber Waves’ won the “Best New Plant” Award in September 2001 at the Four Oaks Trade Show in Macclesfield, England (the largest nursery trade show in the U.K.). It was entered by Kernock Plants, and Bruce Harnett was on hand to receive the certificate. It was made even more special by the fact that Dan Heims was also at the show then and attended the awards ceremony. Needless to say Dan was extremely pleased, and I believe this is a great “launch” for the TERRA NOVA® / Proven Winners marketing initiative. 2001 – Gold Medal at Keukenhof 2001 in Holland. (Heuchera Display). 2001 – Gold Certificate at Coursonne in France for Heuchera ‘Can Can’. 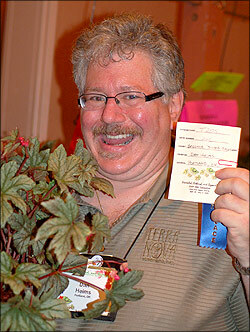 2001 – Best of Show (GOLD at) Four Oaks Trade Show for Heuchera ‘Amber Waves’. 2001 – Best New Product at Scotgrow Show in Scotland for Heuchera ‘Amber Waves’. 2000 – 1 Gold award at Plantarium for Heuchera ‘Ebony & Ivory’. 2000 – 1 Silver award at Plantarium for Tiarella ‘Iron Butterfly’. 2000 – 2 Bronze awards at Plantarium Tiarella ‘Mint Chocolate’ and Tiarella ‘Ninja’. 1999 – 1 Silver award (Medaille d’argent) at Courson (the greatest French horticulture show) ’99 (only 3 plant awards given) for Tiarella ‘Ninja’. 1998 – 2 Silver awards at Plantarium ’98. 1998 – Two Gold medals and 4 Silvers won at VKC Nieuw, a large Dutch tradeshow. 1997 – Heuchera ‘Can Can’, Heuchera ‘Stormy Seas’, Heuchera ‘Chocolate Ruffles’ received 2 gold and 3 silver medals from VKC Nieuw Plant exposition in 1997. 1997 – 2 Gold and 3 Silver medals from VKC Nieuw Plant exposition in Holland. 1996 – Hosta ‘Jade Cascade’, American Hosta Society International Convention, The Pauline Banyai Award, Best Unregistered Seedling, David Van Fleet Award, Best Green-leaved Hosta, International Convention, Best of Section 7, International Convention, Best of Class, International Convention First Prize. 1995 – Heuchera ‘Chocolate Ruffles’, Plantarium ’95, Boskoop, Holland Best New Perennial Introduction Gold Medal 1996.